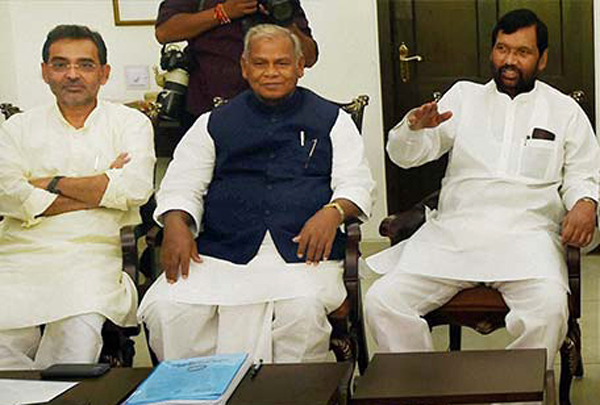 By merging their parties, can Paswan & Manjhi help NDA wean away Dalits from Mayawati? The proposed merger of Sharad Yadav's Janata Dal (United), Ajit Singh's Rashtriya Lok Dal, Babulal Marandi's Jharkhand Vikas Morcha (Prajatantrik) and Kamal Morarka's Samajwadi Janata Party (Rashtriya) has set off a similar attempt among the BJP's Bihar-based allies. 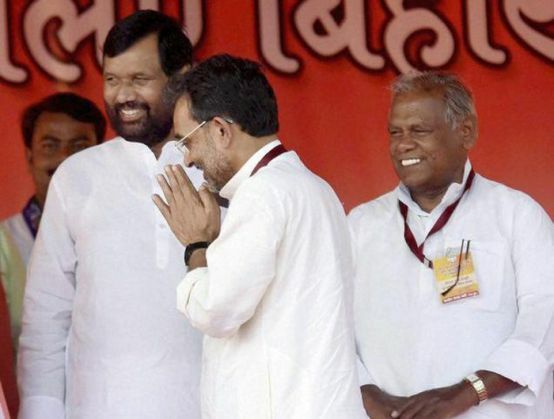 Union minister Ram Vilas Paswan's Lok Janshakti Party, his cabinet colleague Upendra Kushwaha's Rashtriya Lok Samta Party and Jitan Ram Manjhi's Hindustani Awam Morcha (Secular) are mulling a possible merger. The trio recently met at the farmhouse of HAM(S)' Bihar unit chief Vrishin Patel in the state's Vaishali district. Paswan's son Chirag, who is also chairman of the party's parliamentary board, was also present. Paswan himself tweeted about the meeting, along with a picture taken there. Although all the other leaders denied conjectures that they discussed the merger, Patel spilled the beans later. He reportedly told journalists that at a time when so many small parties were merging, it shouldn't come as a surprise if they too decide to become one. He confirmed that the beginning of the merger had indeed been made and called it a demand from the people. Sources say the objective behind the merger is to form an outfit that will have higher bargaining power with their bigger NDA-partner, BJP. That power will be used for asking for a high number of seats, at least 20, for elections to the 403-member Uttar Pradesh Assembly next year. The proposed new outfit will have 9 MPs and 5 MLAs. All three parties have zero presence in Uttar Pradesh assembly and negligible presence in the general political space in the state. However, they might have been enthused by the fact that no party is appearing to be a clear winner in the state as of now. The proposed JD(U)-led merger firmed up their belief that a little share of the pie in UP was possibly up for grabs for everybody. Paswan senior could be the leader of this outfit as he is the senior-most among the three leaders, currently serving his 9th term as MP and 7th stint as Union Cabinet minister. However, the other two are known for their ambitions too. Manjhi has served as Chief Minister of Bihar for a brief while and led a rebellion inside his former party JD(U) when he was asked to vacate the chair. Kushwaha too was in JD(U) earlier and broke away to float his own outfit in 2013. Before last year's Assembly elections in Bihar, Kushwaha tried his best, although unsuccessfully, to wrest the right to contest on at least 80 seats as a part of NDA. He also tried to get the BJP to announce him as the alliance's chief ministerial candidate. His party eventually got only 23 seats and the alliance did not put forward any chief ministerial face. In Bihar, BJP had kept 160 for itself and allocated 40 to LJP and 20 to HAM, apart from RLSP's share. The alliance partners' performance was dismal, as explained above. Their collective vote share stood at a meager 10% in the 243-member assembly. They didn't even succeed in transferring votes in favour of the alliance at places that were considered their strongholds. It is because of this that they did not get any of the promised rewards, like a Rajya Sabha seat for Manjhi. The reason that they are still in the NDA and Paswan and Kushwaha didn't get the boot from the Union Cabinet is because they still command following among their respective vote-banks. While Paswan is the tallest Dalit leader from the state, Manjhi has emerged as the leader of the Mahadalits and Kushwaha's support is among a section of the Other Backward Classes of Bihar. With a 20% Dalit population, the scramble for the Dalit vote in UP could also be a factor that these leaders could be counting upon. However, that field is already over-populated, with BSP as the elephant, quite literally so, among the contestants. The Congress was always a serious claimant and now even BJP has begun eying the Dalit vote. What scope do these biggies leave for this new triumvirate is not hard to see. Nevertheless, they appear to be moving ahead with their plan, undaunted. Is a BSP-Congress-RLD Grand Alliance emerging in UP? TWEET THIS With an eye on UP polls, BJP allies Paswan, Manjhi & Kushwaha may decide to merge By merging their parties, can Paswan & Manjhi help NDA wean away Dalits from Mayawati?